Following the 1997 Asian Economic Crisis, Indonesia entered a sustained period of economic growth. The surge in domestic demand led to engineering industries needing to increasingly import parts and materials. Indonesia clearly had to strengthen the capacity and competitiveness of its domestic engineering industry, and the foremost requirement to achieve that was to develop human resources and strengthen research capacity in engineering. 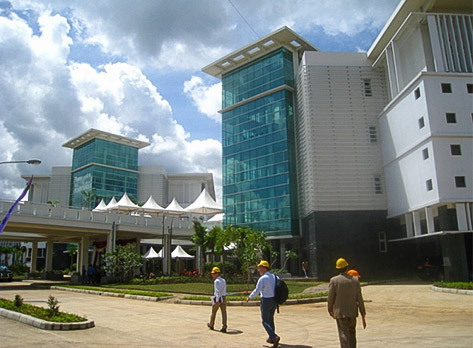 In response, the government of Indonesia sought assistance from Japan to expand the faculty of Engineering of Hasanuddin University (UNHAS-EF) by moving it from the main campus in Makassar, South Sulawesi Province, to a former industrial site in Gowa Regency some 12 km to the south east of Makassar. The faculty was also to incorporate a Center of Technology to promote coordination among the engineering faculty, industrial sector, other universities, and local government and the community, thereby contributing to industrial development in eastern Indonesia. OC Global was engaged to provide project management and engineering consultancy services, which covered all phases of the development, from elaborating the campus master plan to its design, construction supervision, and assistance with procuring furniture and equipment. We also managed the Fellowship and Research Program, which facilitated training and fellowships for Indonesian academics to upgrade their knowledge and skills in Japanese centers of excellence in engineering and technology. The master plan and subsequent design policies aimed to foster community partnerships with the campus, create a compact arrangement of buildings that enables easy circulation, provide a strong campus identity, and pursue eco-friendly features through measures such as passive cooling, natural lighting, and façade design. The construction work under OC Global’s management was broken into four packages: (1) Architecture Department, Civil Department, and common facilities including the Center of Technology, Library, and classrooms; (2) Electrical Department and Mechanical Department; (3) Naval Department and Geology Department; (4) Infrastructure such as water supply, workshop building and electrical facilities. Some parts of the campus such as roads, sports facilities, and student dormitories were developed by the Indonesian government following the master plan developed under our project. As part of its corporate social responsibility (CSR) activities, OC Global’s parent company ACKG Ltd is supporting an initiative to enhance the eco-friendly and smart campus credentials of UNHAS-EF. The campus design already included many eco-friendly features, but the project, titled Eco-Friendly and Smart Campus University, takes the concept much further. By introducing an electricity management system connected to smart electrical meters and renewable energy generating facilities in the campus as pilot projects, the project will greatly reduce electricity consumption from the grid. The campus electricity consumption is displayed in real time on large-screens in the Center of Technology. The project adopts the PDCA cycle methodology: Plan (the actions), Do (the actions), Check (the outcomes), Act (to improve).